Are you looking for a gold necklace or pendant with just that little bit more? An extra element? A piece of jewellery that allows you to carry your most cherished memories or people close to your heart? 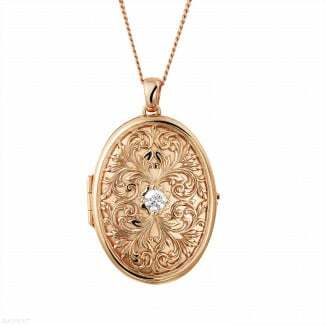 A gold locket is exactly what you are looking for! Moreover, it is also a timeless jewel that suits every style and every occasion. Choose your favourite locket and buy a truly meaningful piece of jewellery. What used to be the function of a gold locket? In the earlier days, a locket was often used as storage box for medicines or to carry perfume and thus offer relieve from the stench of big cities. It was also a popular talisman in the Middle Ages and in Victorian times it served as a jewel for mourning. Throughout time the shape changed from round to oval. Today a locket of gold is still a jewel to be cherished, for many different reasons. Regardless of whether you buy it for yourself or for someone dear to you. You can personalise a gold locket in many different ways. Engraving initials, a full name, a meaningful date or a saying are among some of the possibilities, but storing something personal inside is also an option. Photos are common, but other things such as a note from your loved one, your child’s first baby tooth or a lock of hair from a deceased relative can be used as well. Each locket from our collection is available in white gold, yellow gold and red gold. Cannot find what you are looking for? No problem! Let your imagination and creativity run free and collaborate with our experienced professionals to create a tailor made necklace. We will do our best to design the jewel of your dreams. Moreover, when buying your jewel online at our web shop, you will save up to 30 or 50% compared to your local jeweller. That is just one of the many reasons why you should buy your special piece of jewellery at BAUNAT. What if I want a different shape? Which can I engrave on the locket itself? Ask the BAUNAT experts for advice.